Want to learn a few new ways to lace your shoes? If your shoes have twelve eyelets, there are about two trillion ways to lace them up, according to Ian Fieggen, also known as "Professor Shoelace." You can be as practical or as creative as you like when it comes to lacing your shoes. Try some of the coolest options yourself. 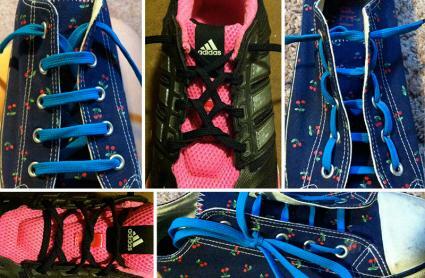 The most common shoe lacing technique is the crisscross method. This is the way most people are taught to lace their shoes when they are kids. Put the lace through the bottom eyelets from above. Pull each lace through the eyelet opposite it, from below, alternating ends. Continue in this manner until you reach the top of the shoe. It's easy to catch on to a simple variation of the crisscross technique where the laces alternate. Start with steps one and two from above. Switch the order of the ends. If you started with the left side on a crisscross, start with the right on the next one, and vice versa. Continue this pattern until the top of the shoe. Notice that a different lace will be on top in each alternating crisscross. The straight European lacing style gives the illusion of a zigzag pattern below horizontal lacing. The look consists of alternating diagonal and horizontal lines with each side of the lace. This pattern results in a snug fit. 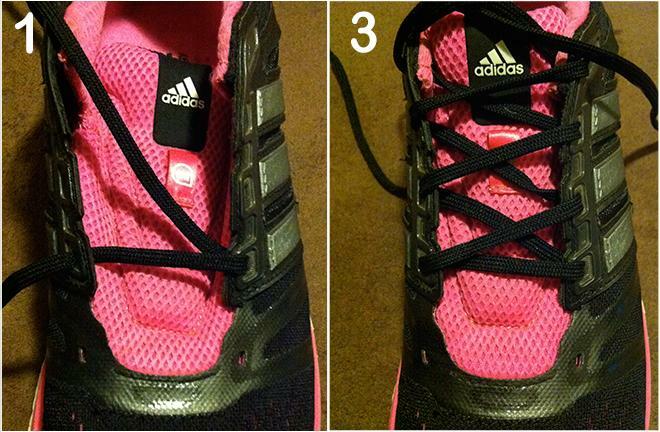 Start with step one from crisscross lacing. Cross the left end diagonally, to the first open hole on the right side, pulling the lace through from underneath. Pull the left end across to the right, into the first open eyelet from above. Cross the right end diagonally at a larger angle than you did with the left, so you can pull it through the next open eyelet on the left from underneath. Pull the end of the lace across to the right and enter the eyelet from above. Continue this pattern to the top of the shoe. This style is exactly what it sounds like - your laces will take on the form of a ladder. Start with both sides of the lace coming up through the bottom set of eyelets. Insert them (without crossing over) into the next set of eyelets. Continue with the left lace all the way to the top. Now, do the right lace, with the opposite pattern of the left. 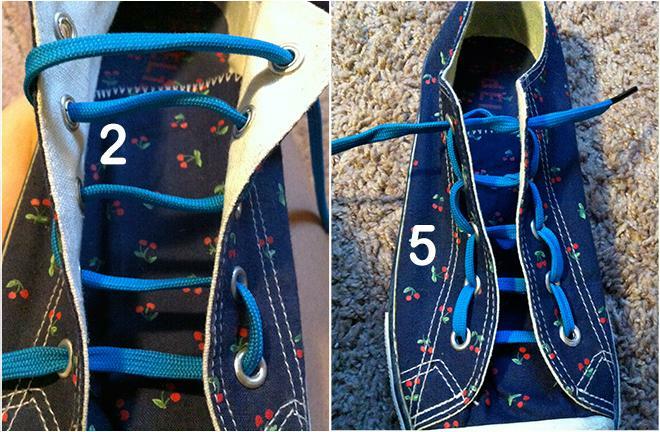 Loop the lace back through the same holes the left lace is already in so the laces overlap in the middle. This technique not only looks out of the ordinary, but proves useful as well. You can knot the laces on either side depending on whether you are hiking or biking. Tying them on the inside keeps your shoes from snagging on undergrowth and tying them on the outside keeps them from getting caught in bicycle chains. Start by pulling both ends of the laces through the bottom eyelets. On one side, drop the lace into the next eyelet up. On the other side, skip one hole and insert the lace into the next. Run each end of the lace horizontally from their current position, then run both ends of the laces up their respective side, skipping one eyelet and inserting into the next. You will know you did it right if each eyelet is only used once. Note that this method only works if your shoes have an even number of eyelets. Otherwise, you will have to skip a pair of eyelets so that you finish with both ends of the lace on the same side of the shoe. 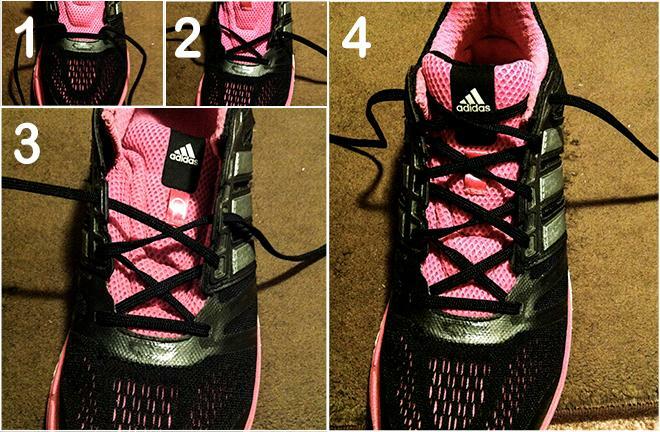 While this cool way to lace shoes looks complicated, it's really quite simple. Start by inserting each end of the lace up through the eyelets at the bottom. Follow the crisscross method with one variation - go underneath the lace that you just pulled through when you cross over to lace through the opposite side. Repeat all the way up the shoe. Reminiscent of the shape of DNA, the double helix lacing method employs a continuous spiral. At the bottom of the shoe, start by feeding the left end through from underneath and the right end through from above their respective eyelets. Pull the laces through the same way you would with the crisscross method, except that when entering the eyelets on the left always enter from below, and when entering the eyelets on the right always enter from above. Meet the laces in the middle at the top of the shoe. Trouble with your shoes falling off? Not anymore. Keep them super-tight with this method. Start by pulling the lace through from underneath the bottom eyelets. 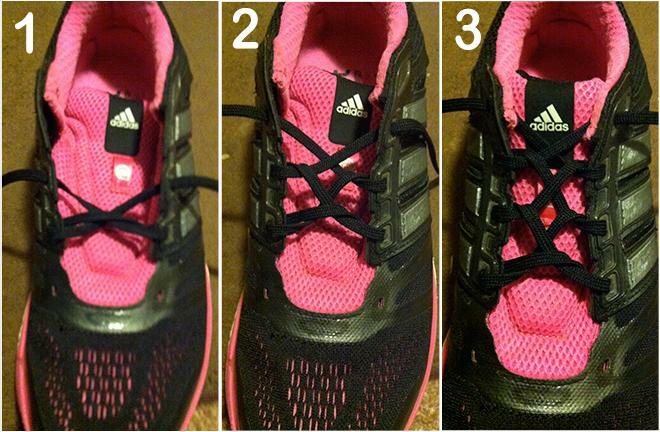 Follow the crisscross method, but tie an overhand knot in the laces each time they cross each other. Continue to the top of the shoe. You can choose a method because you like the way it looks, of course - but they way you lace your shoes can also help with specific challenges or needs. 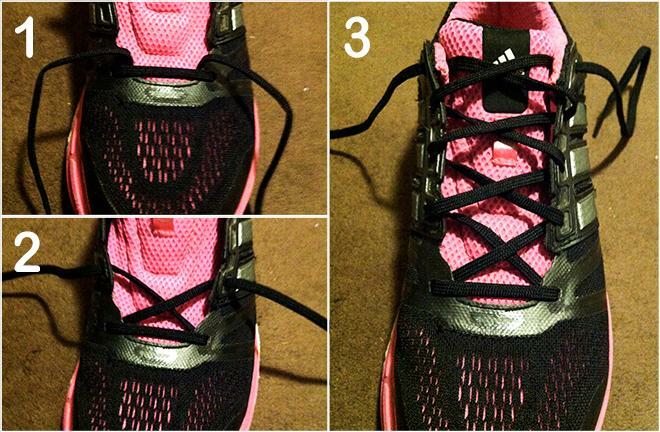 Shortening too-long laces: There's no need to trip over your laces. 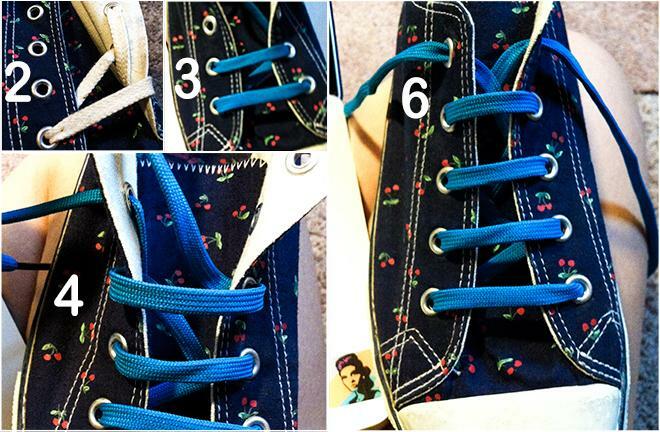 Try the zipper or the straight European methods for shorter laces. To shorten them even more, try the ladder. Protecting laces against friction: If you're concerned with wearing your laces out from friction, try the alternating method or the double helix. Improving lace and shoe security: If you need help tightening your laces or keeping your shoes on, try knotted lacing or the zipper. 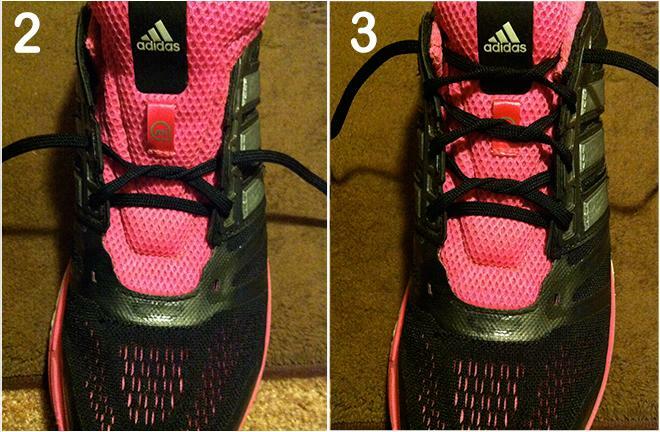 One of the best ways to emphasize your new lacing is to purchase different colored laces. Plain white will work but it won't stand out in most cases. Do, however, check with your school or workplace first to make sure you're not breaking dress code rules by switching out your old laces for more colorful ones. 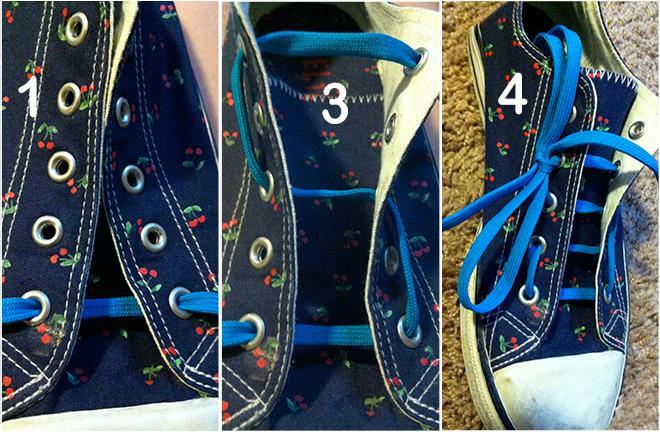 Experimenting with ways to lace shoes livens up an old pair of sneakers and shows off your creativity. Try the lacing methods above and see what options you like the best. Once you've mastered these techniques, you might want to see if you can come up with a few of your own.